The Eurasian lynx (Lynx lynx) is a medium-sized cat native to Europe (Including Finland, Sweden, Norway) and Asia. It is one of the largest predators in Europe and Asia. It is the largest of the lynxes with a length of 80–130 cm. Eurasian lynx are the largest of the four lynx species. They are one of the largest predators in Europe, after brown bears and grey wolves. They weigh from 18 to 36 kg and body length is 80 to 130 cm. Males are larger and more robust than females. During summer, lynx have a short, reddish or brown coat, while in the winter the coat becomes a thicker and silkier fur, colored silver-gray to grayish brown. Lynx are solitary creatures. The only long lasting relationship they form is between mother and cubs. They are most active during early morning and evening. Lynx are terrestrial mainly, but they are able and adapted to climb and swim. Eurasian lynx can survive up to 17 years in the wild and about 24 years when captive. The juvenile rate of mortality is high. Lynx prey mostly on small to fairly large sized mammals and birds. Among prey for the species are hares, rabbits, marmots, squirrels, dormice, other rodents, grouse, red foxes, wild boar, foxes, chamois, moose, roe deer, red deer, reindeer and other ungulates. It is a carnivore, consuming about one to two kg of meat every day. Although taking on larger prey presents a risk to the animal, the bounty provided by killing them can outweigh the risks. The Eurasian lynx thus prefers fairly large ungulate prey, especially during winter when small prey is less abundant. They are the only Lynx species in which ungulates provide more of their diet than lagomorphs or rodents. Where common, roe deer are the preferred prey species for the lynx. Even where roe deer are quite uncommon, as in Sweden, the deer are still the favored prey species, though in summer smaller prey and occasional domestic sheep are eaten. In parts of Finland, introduced White-tailed deer are eaten mostly regularly. In some areas of Poland and Austria, red deer are the preferred prey and, in Switzerland, chamois are taken. They will also feed on carrion when it is available. Adult lynx require 1.1 to 2 kilograms (2.4 to 4.4 lb) of meat per day, and may take several days to fully consume some of their larger prey. Found in the Chinese provinces and Northern Pakistan. Most Eurasian lynxes are in Russia. In 2008, there were about 1905–2060 lynxes in Finland. In Sweden there are about 1,400. In Norway there are between 409 to 439. ↑ 1.0 1.1 1.2 "Lynx lynx (Eurasian lynx)". Animal Diversity Web. Retrieved 2018-06-26. ↑ Molinari-Jobin, Anja; Zimmermann, Fridolin; Ryser, Andreas; Breitenmoser-Würsten, Christine; Capt, Simon; Breitenmoser, Urs; Molinari, Paolo; Haller, Heinrich et al. (2007). "Variation in diet, prey selectivity and home-range size of Eurasian lynx Lynx lynx in Switzerland". Wildlife Biology 13 (4): 393. doi:10.2981/0909-6396(2007)13[393:VIDPSA]2.0.CO;2. http://www.wildlifebiology.com/Downloads/Article/685/En/molinari-jobin%20et%20al.pdf. ↑ 3.0 3.1 3.2 Diet of Eurasian lynx Lynx lynx in the northern Dinaric Mountains (Slovenia and Croatia). DeepDyve (2011-10-01). Retrieved on 2012-07-27. ↑ Odden, John; Linnell, John D. C.; Andersen, Reidar (2006). "Diet of Eurasian lynx, Lynx lynx, in the boreal forest of southeastern Norway: The relative importance of livestock and hares at low roe deer density". European Journal of Wildlife Research 52 (4): 237. doi:10.1007/s10344-006-0052-4. 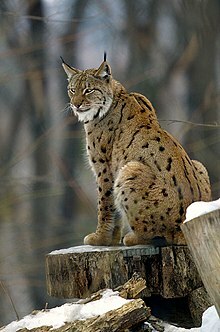 Wikimedia Commons has media related to Lynx lynx. Wikispecies has information on: Lynx lynx.